What turned into a bit of a series (honest! ), so far I’ve included a 1980’s Hoover advert featuring Alan McDonald, and then there was Phil Parkes’ endorsement of Cossack Hairspray. Also Dave Thomas and Don Givens were used in a campaign by Gola in the 70’s. 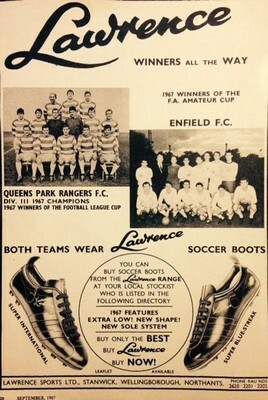 This latest one, which appeared in September 1967 for Lawrence Sports, featured a Rangers team group alongside Enfield FC, with the headline: ‘Winners All the Way’. Apart from the R’s, there were other notable endorsements from the likes of Tom Finney, Jimmy Greaves and Matt Busby. Lawrence Sports were a football boot manufacturer based in Northants, who operated from 1958 until 1973, when the larger brands began to dictate the market.